In the Part 1 of this interview, Kate Prouty shared some of her strategies for growing a practice from scratch to a full-time, busy practice. In one year, she implemented a lot of ideas. Some of them landed in the last post, and the rest are featured here. Here in Part 2, we continue the conversation about Kate’s outreach to local hospitals and medical professionals. 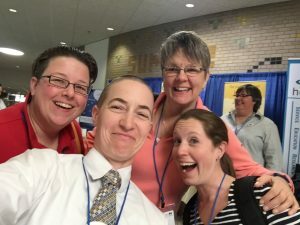 She tells us about studying hospital-based massage therapy at the Mayo Clinic, and how she used her studies to grow her practice. Kate shares her practice-building advice for other massage therapists and specifically for oncology massage therapists. She tells us about the materials she created for outreach to physicians’ offices. Tracy: From what you have said, it seems like you created a real partnership with your clients. Please tell me about your partnership with hospitals, a work in progress. An example of Kate Prouty’s “Info Sheets” she uses as graphics for her Facebook business page. Kate: Well, first I found a nurse navigator at a hospital, while doing research for your mentorship program homework. I put together materials from the mentorship program to bring them, and I gave them a lot. They seemed eager, but in the process of negotiating, they set up terms that weren’t so favorable, given where I would be working. Then I found a nurse navigator at a second hospital. I also found that there were two oncology social workers on staff there who had received an award. When she mentioned them, I responded, “Oh, wasn’t that the person who received that award?” She seemed impressed. I asked her to write a quick email saying I would contact them, so she wrote me an intro. Then I emailed the oncology social workers. I heard back and they invited me for a meeting. Tracy: What did you bring to that meeting? Kate: I had learned not to show my whole hand at once. She asked me what I had in mind for their hospital. I said the more important question was, “What do you need?” Tell me and I’ll tell you what I’ve got. I don’t want to present all sorts of stuff your hospital doesn’t need. We went back and forth with meetings and calls and brainstorms, then she invited me to give a couple of presentations. I did one at a breast cancer fitness group luncheon. With the other oncology social worker, I gave a class on self-massage or friend massage, techniques you can use to lower stress levels when anxiety hits. To that second hospital, I brought the updated research on massage therapy, what you reviewed in the oncology massage therapy mentorship course. And I gave them info on fee-for-service vs. other funding, the different methods I have learned about from other hospitals. I knew I couldn’t scrounge up funding for them, but I was perfectly happy passing along useful information. Now they are working on a grant, using those materials. 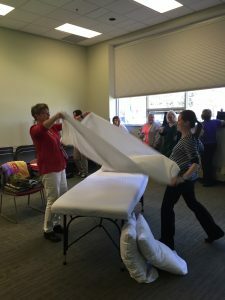 Tracy: While you were taking the Mayo Clinic Hospital-Based Massage Therapy Course, you blogged about it. I notice you posted on Facebook about the lessons you were learning. How did that help your practice? Kate: Well, actually, I started the blog so that my parents could see what I was doing! But also, I had run a “before-and-after” Mayo special. It was two massage sessions for $100. They would receive one massage before I traveled to take the course, and one after. Those clients paid ahead of time so I could pay for my housing at Mayo. This required seeing new clients—people I’d never seen before. I did specify that this was ideal for someone with a complex condition. Cancer, recent surgery, others. As I promoted it, I said, “If this doesn’t apply to you, please pass along this special to someone you know.” So I got a ton of referrals for that program. Tracy: How did you work with those clients? Offering this special gave me many chances to tell my Mayo Clinic story. I wanted to get the Mayo Clinic training out there. I did about 40 of these sessions, and each time, I got to share a bit of my story of the Mayo course. I got to repeat my story of a practice client at Mayo Clinic, whose post-surgery pain dropped from 8 to 2 after a massage session. It was a great training, as I describe in my blog. But studying at the Mayo Clinic also lent my practice a certain credibility. It has been fun to spread the news about it in different ways. Tracy: What advice would you give to other MTs about building a successful practice? Kate: I would say be careful of how you choose your continuing education. Because you can study and spend a lot, and it may make you feel like you are doing a lot. But you might not be gaining what you can use or gain you credibility. Research who is teaching, and their background. Also, from my marketing friend: Do everything as cheaply as possible unless you have to spend money. To decorate my office, I grabbed things from my house. It wasn’t the right time to spend money. I have done all the free advertising I could. I have talked to a lot of people, then I have looked back at what worked. I loved writing down my marketing efforts every month. With that practice, I made sure I was doing marketing efforts every month! I have a record of what I actually did. It’s garbled and gibberish but I love looking back at it. Tracy: How about oncology massage therapists? What advice would you give them in building a practice? Kate: Obviously, take the mentorship program. Also remember that people love to be asked for advice. For every contact you make, ask them who else you should be talking to. Humbly request an email introduction. Be sure to use the word “oncology” and “cancer” in your advertising up front. Not all over the place, but up front. That is all I need sometimes. It catches people’s eye. And remember: You’re not necessarily marketing your work to the person with cancer. You are also marketing yourself to her 46-year-old daughter, the one in charge of her appointments. I’ve gotten possibly more people from that than anything else. People coming to try me out “before I bring my mom in.” Market to the person who loves the person with cancer. Use local referral groups. Facebook is your friend. It’s cheap. It’s free. Tracy: And what about those info sheets? You’ve created an info sheet for each of several medical conditions! Some research about massage therapy benefits, along with your contact information. What do you call those things? Info sheets? I also realized: I can’t go in empty-handed. I can’t afford to bring them lunch. A SCORE (Service Corps of Retired Executives) counselor (I still keep up with her) suggested this: GIVE THEM DOCUMENTS. Something to read. A single page glossy. Then hand it to whomever is in charge. Hope that it gets pinned to the break room wall. Tracy: How did you choose the medical conditions to feature on each info sheet? Kate: I struggled to figure out what to put on them. I googled the most common causes of doctor’s appointments and chose from that list. For topics so far, I’ve chosen fibromyalgia. Low-back pain. Migraines. Anxiety. Cancer gets several different ones, each with a different focus. And another, very different info sheet that describes how my practice grew! Tracy: What is the format? Where can people find them? Kate: It became so much easier once I developed the format. I finally made a template. A couple of text boxes. Some graphics. For each one, a single citation. All citations come from medical journals, non-massage sources. I know a physician is more likely to respect a clinical trial of massage published in these sources. I know their time is important and tight. So for these info sheets, I do the work and research and get the citation and make it easier for them to have a reason to recommend massage therapy. Look on my Facebook page, “Patient Relaxation LLC.” You can find examples there. Kate: I chose “Patient Relaxation” very carefully. First, the idea of patience. No rush. That kind of patience. But when I was coming up with the name, I knew that eventually I wanted to be working in hospitals or at least coordinating with medical practices. I wanted the patients to know I was focused on them. That I wasn’t just looking for “people off the street,” but that I was specializing in people who were medical patients. I didn’t call it “Patient Relaxation Massage Therapy” because I may someday incorporate other modalities into my business. In my area, there was recently a research study done on the effects of reflexology and cancer patients. That was a huge success and spread information about reflexology to the community and created a market for it. While I personally do not do reflexology, and I don’t plan on it, I might hire a reflexology provider someday to work in the hospitals. I didn’t want to limit my growth by including “massage therapy” in my name, once I’d established it. 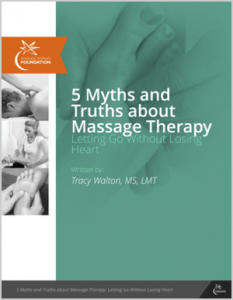 Tracy: How long have you been a massage therapist, and how did you get into it? Kate: I’ve been a MT for … hmm. 5 years? 5.5. I went to Lansing Community College, where I now teach. I went there — honestly– because I was intellectually frustrated after being a professional musician for 25+ years (orchestras, teaching privately and in colleges, judging, etc). I literally googled “Return on investment careers” and it was either massage therapy or radiology support. Kate: Seriously, I did. I wanted financial independence and schedule independence. Massage therapy is growing, especially in my area. I looked at the department of labor statistics, and decided it was the best choice. I could do massage school while still teaching and playing, and in 1 year I could be working. But it took some serious thinking, and asking actual experts for help, to make the music-to-massage-therapy transition. Tracy: After you graduated, did you ever start a serious private practice before this past year? Or did you go straight into working for others? Kate: Just employment. I tried one time, for a few months, to be both employed and have a private practice, but back then I knew nothing about how to market massage. I was so hopeful, but also so … directionless. I didn’t know my niche. I didn’t know how to get anyone’s attention. So I had my 11 faithful followers, but that was it. Tracy: How much music are you playing and teaching these days? Kate: I have cut down my music teaching to almost nothing. But I am playing more. Not necessarily to make money. I’m saying yes to things that I want to do. 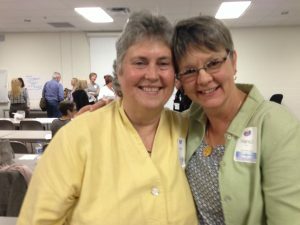 Tracy: What drew you to study oncology massage therapy, then our mentorship program, back in 2017? Kate: Well, I researched who Tracy Walton was. Your education, background, writings, associations, and colleagues. I wanted to make sure your training was credible, fact-based, well-trained in science, well-regarded by physicians, oncologists, and scholars. I felt sure that you and these courses were the very best I could do. Now that I have the two courses under my belt, I am confident that the information I have gained is true, factual, and well-reasoned. It was delightful to find that in addition to all of this science and reason, there was as beautiful heart, a sweet soul, and an inspiring fire. I personally have struggled with the dichotomy of science vs intuition and heart, and it was nicely embodied in you and your teaching. Tracy: Thanks for that. Kind words, for sure! Yet I see that combination of qualities in your work, your marketing materials, your social media presence. Also, in the trajectory of your practice. Many congratulations for your success! Thank you for sharing everything you’ve shared with us. She thrust her backpack at me on her way to the front porch. “Will you carry it for me?” As I fumbled with the door, I was torn between reminding her to say “Please” and lecturing her about being able to carry her own backpack. Except that suddenly I was holding the backpack, and too startled to speak. The bag bulged, sagging heavily in my arms. My entire 45 lb. daughter might as well have been inside. “What’s in here?” I said, fighting my rising irritation. My throat caught. I held up the bag, regarding it. My daughter WAS in there. Tenderly, I slid the strap over my shoulder. She reached for my hand. I held hers, and we began the walk to school. I don’t need to get started here on the collision between backpacks, children and body mechanics, or the number of times I have massaged the damage. Those things were far from my mind. What was on my mind was the moment and mood that were transformed within me, in a second’s time. That moment makes this a story about me, rather than a story about my daughter. I don’t question her adorableness and innate love, that was there all along.What changed was my ability to notice it. The element of surprise changed my thoughts, from a story I was telling myself to the actual story that was happening right then and there, the story that was true. Through parenting, I have been surprised again and again. Often pleasantly, sometimes not. But with each surprise, I am moved from some abstract place into the here and now, in the present moment. It has increased my presence to the moment. A free gift. Another freebie: That morning, I was reminded that we carry those who carry those who carry those who carry those. I was carried by the goodness circling back and through me. It reminded me that if we are carried, I am carried, too.